Students studying blood and the lymphatic students can get overwhelmed with the terminology used to describe blood and how blood is categorized. 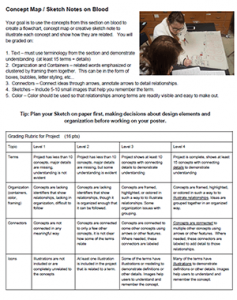 This project is designed to help students organize these difficult terms by creating a large concept map which groups related ideas together and connects them to other ideas – a concept map! Students use color, sketches, containers, and arrows to develop a creative project that will help them build a mental map of the blood and the lymphatic system. I usually give them some guidance at the beginning by suggesting they start with the erythrocytes, leukocytes, and thrombocytes as their main BIG IDEAS, and then create detail branches from them. I have previously used this concept map where students fill in words for a partially completed blood map. I’m not sure students get as much out of the fill-in-the-blank maps as they do from the ones they create themselves, but they are much easier and don’t take as much time. Students can create these maps on posters, or computer paper, but larger surfaces tend to work better. I use a roll of butcher paper to use with this project and others similar projects, like the Concept Map on Tissues.